If Dr. Dino Martins wanted to, he could have a very long and successful career in academia at his pick of Ivy League universities. But that has never been his desire. Growing up in Eldoret with no television, Dr. Martins had to find his own fun. His earliest memories are of him running around outside, identifying insects and trying to figure out aspects of their character. He got into breeding butterflies and moths and cemented “his first love of natural history and insects.” He decided to go to Indiana University, in the U.S. state of Indiana, on a scholarship realising that he still wanted to be in a place where there was a connection to nature. There, he double majored in Biology and Anthropology. The intriguing mix of the study of people and the study of biological systems are quite integral to the work that Dr. Martins has gone on to do, with an emphasis on the interactions between different species and people. “Science should be a coproduction of knowledge,” he asserts, reflecting on his journey in conservation and entomology in Kenya. 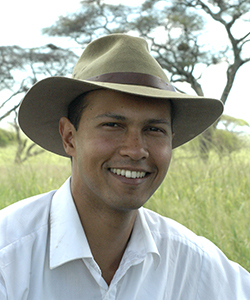 He has contributed to six guidebooks of Kenya’s national parks in partnership with the Kenya Wildlife Service (KWS), worked with the Environment Liaison Centre International (ELCI) and has spent the last few years as the Executive Director of Mpala Research Centre as well as a research scholar and a lecturer at Princeton University. His mission is to find a way of “including people rather than excluding them” and he has done so by reaching out to the next generation of Kenyan scientists and helping to build them up, much like his mentors over the years have done for him. He cites exciting ongoing research by Dedan Ngatia on the severity of rabies amongst wild dogs as emblematic of the progress of scientific research in Kenya. He is most looking forward to a project that has just recently received funding: the building of a full lab that will allow for genomics, genetics, reading stable isotopes, and endocrinology, all led by a team of Kenyan scientists. Learn More about Dr. Martins on Discover Pollinators here, the Mpala website, www.mpala.org, or his TED Talks here.